The UK has no written constitution. Nor does England have a constitution, neither written nor formulated. The United Kingdom is one of the few countries of the world that does not have a written constitution: it just has what is known as an "uncodified constitution". Thus the only "British Constitution" that exists is a set of rules and regulations constituted by jurisprudence and laws (English and Scottish law), and by various treaties and international agreements to which the United Kingdom has signed up. This uncodified constitution has largely developed out of historic English law, since many of its founding principles and essential laws go back to charters and bills that were drawn up by the English parliament long before the creation of the United Kingdom. Although England's parliament, often called "the mother of parliaments" has existed for over seven centuries, the founding document of England's "constitution" is generally considered to be the Magna Carta, or Great Charter of the Liberties of England, which the barons drew up and forced King John to sign in the year 1215. The spirit of this document has guided the evolution of English law over the centuries, as well as inspiring numerous constitutional documents drawn up by other countries, including notably the Constitution of the United States of America, and the Universal Declaration of Human Rights. Among other landmark bills that have established major new principles in the British Constitution are the English Bill of Rights, passed after the Glorious Revolution of 1689, and the Acts of Union, of 1707, establishing the linking of England and Scotland within a United Kingdom. The absence of a written constitution is causing a major constitutional argument about what a government can do without the consent of Parliament. Constitutional experts tend to agree that Parliament must be consulted, and vote, before the Prime Minister can activate Article 50 of the Lisbon Treaty, to take the UK out of the European Union. However Theresa May and her government thought differently. The Prime Minister did not want a debate, or a vote, in Parliament before Article 50 is triggered. In July 2016, a group of citizens appealed to the High Court to stop the government activating Article 50 without Parliament's consent. On 3rd November, the High Court delivered its verdict. This verdict was confirmed by the Supreme Court on 24th January. Parliament must vote before Article 50 of the Lispon Treaty can be triggered. Parliament is not bound by the result of the Brexit referedum, which was consultative, not legislative. Before the referendum, three quarters of elected MPs were against Brexit ; this is one of the reasons why it remains possible that Brexit will not actually take place; Parliament has the power to veto it. However this is unlikely to happen. If Parliament vetoed a process that had been approved (however marginally and on the basis of however many lies) a process that had been approved by a popular referendum, it could lead to a massive constitutional crisis and possibly serious trouble on the streets. Parliament is supreme. It is Parliament, as the representative of the "estates" of the nation - monarchy, aristocracy, church and people - which makes laws. Parliament cannot act illegally, nor anti-constitutionally, as Parliament determines what is the law of the land, and a bill that is passed by Parliament, and signed by the monarch, is by definition constitutional. In the past, the Monarch could refuse to sign bills; but today he or she has to sign any bill passed by the two chambers of Parliament. In past centuries, the Parliament was inspired, and laws were dictated, by the Monarch and the Upper Chamber, known as the House of Lords. Since the 19th century, parliamentary power has been held by the elected members of the Lower House, known as the House of Commons. It is here that the Government of the day introduces and debates most new legislation, and for any new bill to become law, it must be "passed" (accepted) by the House of Commons, as well as by the House of Lords, and finally signed into law by the Monarch. 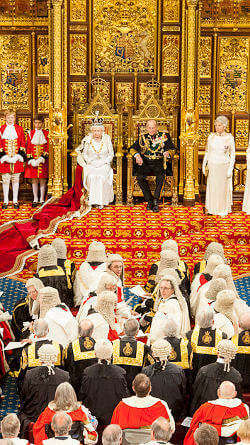 Legislative programmes are determined by the Government in power, known as "Her (his) Majesty's Government". In theory, the government is appointed by the Monarch; in practice, the monarch no longer has any choice in the matter. He or She appoints as Prime Minister the leader of the political party with a majority in the House of Commons; or, if no party has a majority, the leader of a coalition that has been agreed between party leaders. The Prime Minister then appoints the Ministers of "Her Majesty's government ". As well as piloting its legislative programme through Parliament, the government can also manage the day-to-day affairs of the nation by using "statutory instruments" to make administrative changes or minor modifications to existing legislation; these are not submitted to Parliament for approval . The body of legislation passed by the British Parliament accounts for the major part of the nation's uncodified constitution. Since the British Parliament is supreme, the United Kingdom is a unitary state. It is neither federal nor confederal. While Scotland, Wales and Northern Ireland have their own parliaments or assemblies, with delegated powers, these regional governments are subsidiary to the British Government in London. The British Parliament can, if it chooses to do so, take back any powers delegated to regional assemblies. This does not usually happen, but it can, and it did in 1972, when the London Parliament provisionally suspended the Northern Ireland Assembly (Stormont), on account of its inability to properly manage the affairs of Northern Ireland during the time of the "troubles". After Parliament, the other great base of the United Kingdom's uncodified constitution is "Common Law". Great Britain does not have a "penal code" nor a "civil code"; its "Common Law" is the fruit of centuries of jurisprudence, that is based on historic principles of "natural law" (moral law, founded on historically accepted basic principles of right and wrong) . Common Law, though based on the principle of "precedent", can change at any moment, as it is determined by judges; for this reason, it evolves slowly to reflect changes in society and social norms. It cannot evolve in a manner that is in contradiction with social norms or parliamentary law, as any controversial verdict based on common law would be challenged in the courts of appeal. Finally, there are other elements that serve to define the rights and obligations of the British people. Britain has signed up to numerous international conventions and treaties, which can determine the legality or otherwise of actions or processes, such as marine pollution or human rights. European law also applies in the UK, and according to the principle of Primacy included in the charter of the European Union, EU law takes precedence over UK law in any event of incompatibility. The United Kingdom is not a secular state - at least, not in principle. Ever since the Protestant Reformation in the 16th century, the British Monarch has also been the official supreme governor of the Church of England, the "Defender of the Faith" - fidei defensor. Each coronation takes place at a ceremony at Westminster Abbey, where the new monarch is crowned and blessed by the Primate of the Church of England (the Anglican church), the Archbishop of Canterbury. In addition, twenty six Anglican bishops sit in the House of Lords. These aspects are part of the ritual or ceremonial heritage of England. In reality, the Monarch takes no more part in the running of the Church of England, than he or she does in the nation's government. And the Bishops who sit in the House of Lords can only have a marginal influence on debates in the House which, as previously noted, does not have the power to oppose government legislation passed by the House of Commons. Their main function, in the 21st century, is to act as guardians of moral or socially equitable values in the British parliament; this does not mean "conservative" values, as was shown when the UK Parliament was one of the first national parliaments in the world to approve gay marriage. Being uncodified, the Constitution of the United Kingdom is in a state of constant flux. Each new law, each new major decision by judges, becomes a new stone in the edifice of the British Constitution. Thus, the British constitution changes all the time, very slowly, often imperceptibly. Britain moves forward by evolution, not by revolution. Currently, one of the changes being discussed is the modernisation of the House of Lords, to make it at least in part a chamber to which members can be elected. At present, this is not the case. The Cameron government pledged to introduce chages in the life of the present Parliament, but British voters are not very concerned by this issue. It does not arouse much passion on either side of the argument. As of 2014, it seems unlikely that this "constitutional reform" will be enacted before the next General Election; few people in the UK think that constitutional reform is is necessary, let alone essential; the UK functions fairly well without a written constitution, and without big changes to the uncodified constitution that it does have. When it comes to change, the Government and the British people have other more important and urgent things to think about. Photos of the House of commons and of the Opening of Parliament, reproduced by permission of the British Parliament. Photo British prime ministers; The White House.